What can we say about May? It has been very cold here; a lot of rain and wind and plants are not as far along as this time last year. 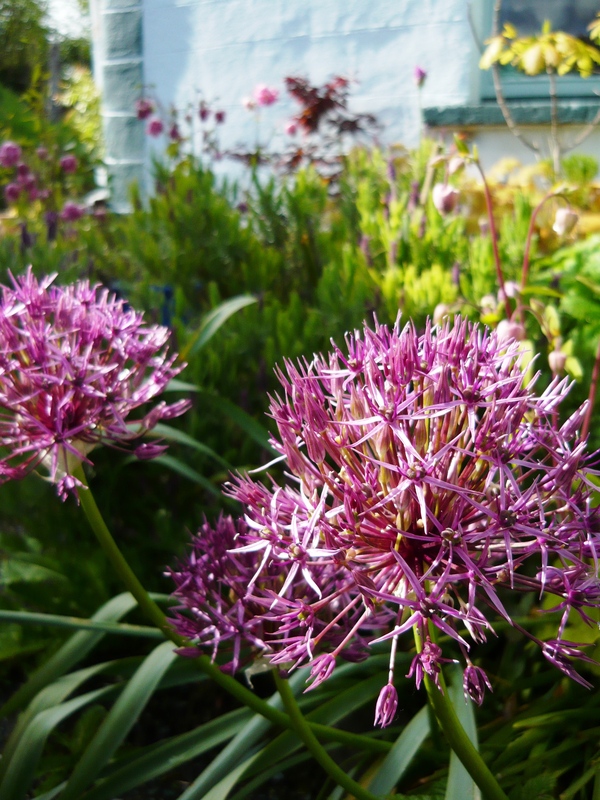 Our alliums are just starting their beautiful display at the moment. In the kitchen garden our potatoes are doing mighty, and we have now added three tires to each stack and earthed them up several times. We have not grown potatoes here before, so it is nice to see them doing so well. We have also planted some Oca tubers and can’t wait to see how they do. Once a highly praised food by the Incas, we are hoping they will do well in our rainy climate. The slugs are abundant so unfortunately a lot of our salad and brassicas have been devoured, and not by us. At least they have had the decency to leave our onions and artichokes alone. 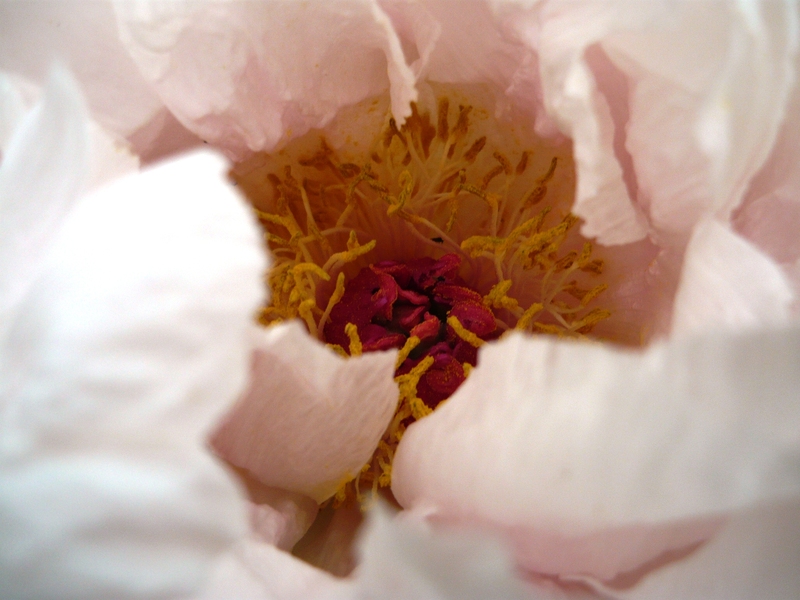 We planted a tree peony last year in one of the beds around our circle and it had a very beautiful flower earlier in the month. 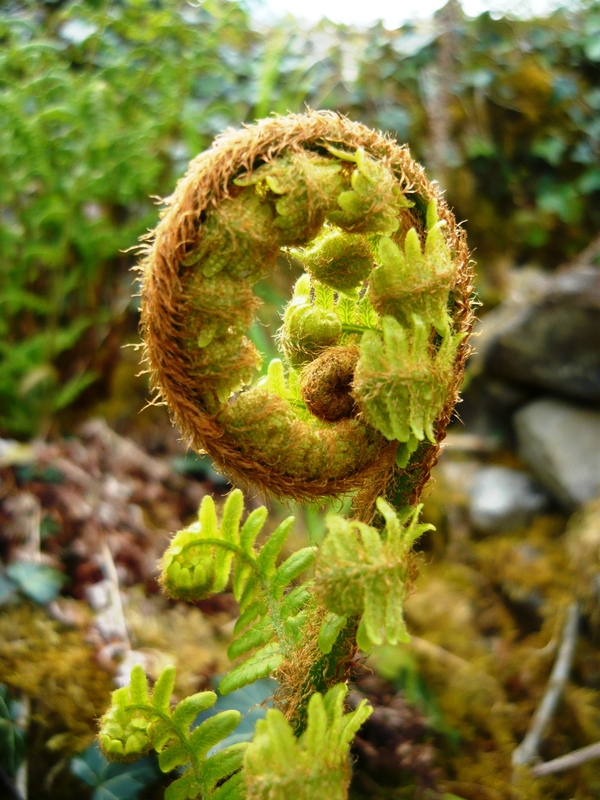 We always write a bit about what is going on around the circle and garden once a month and all of these posts can be found in the category, Elemental circle. 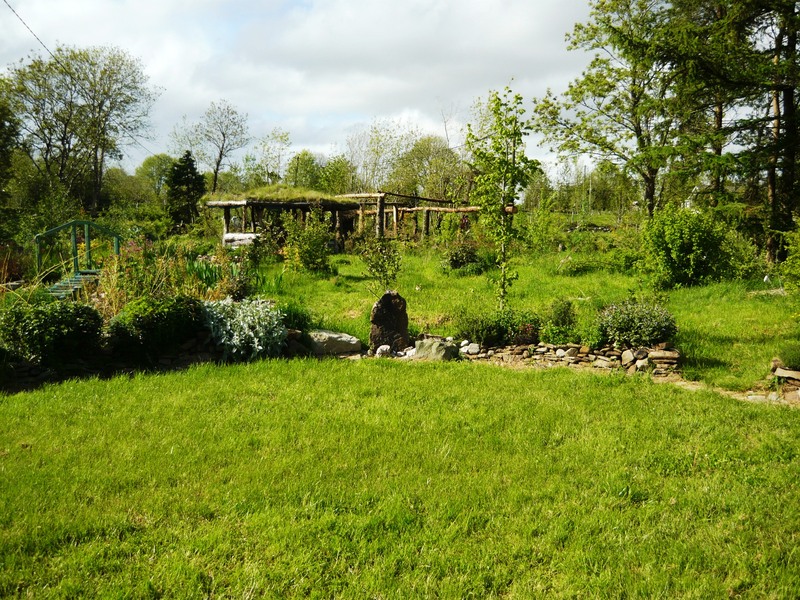 As you can see on the following photos our circle has a lot of lush green growth, but not that many flowers yet. 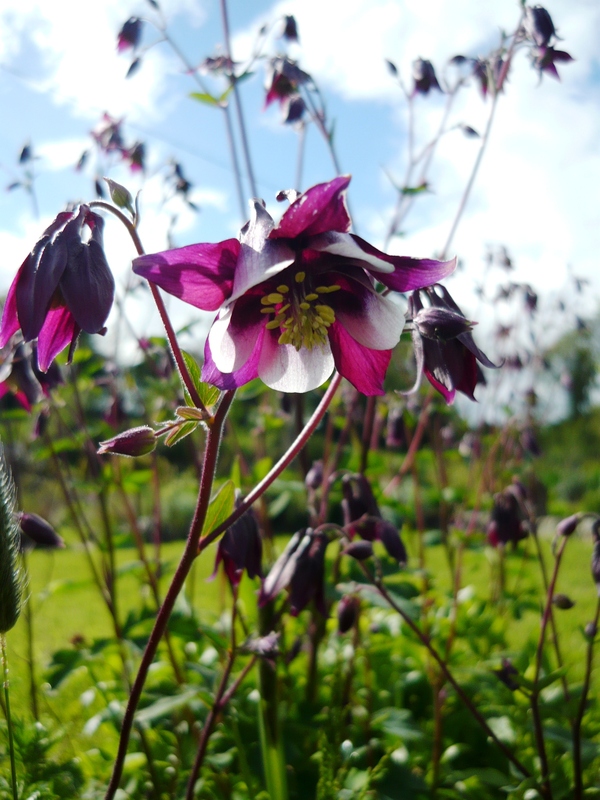 We are happy to look at the Aquilegias though, that we grew from seeds two years ago. The dark one is called William Guinness and the green and pink one is the lovely Nora Barlow. 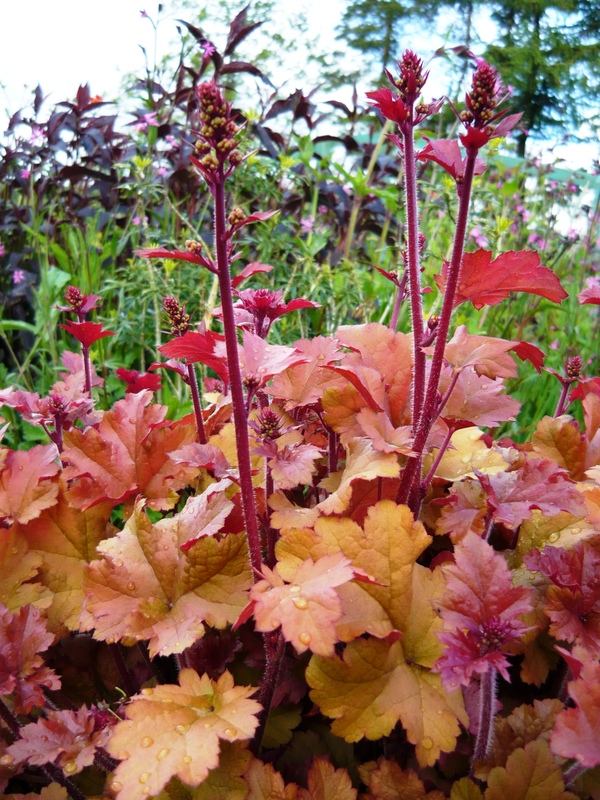 We will leave you now, with a picture of one of our favourite heuchera, Marmalade. It looks best in full sun, so we can admire it occasionally, between the showers. 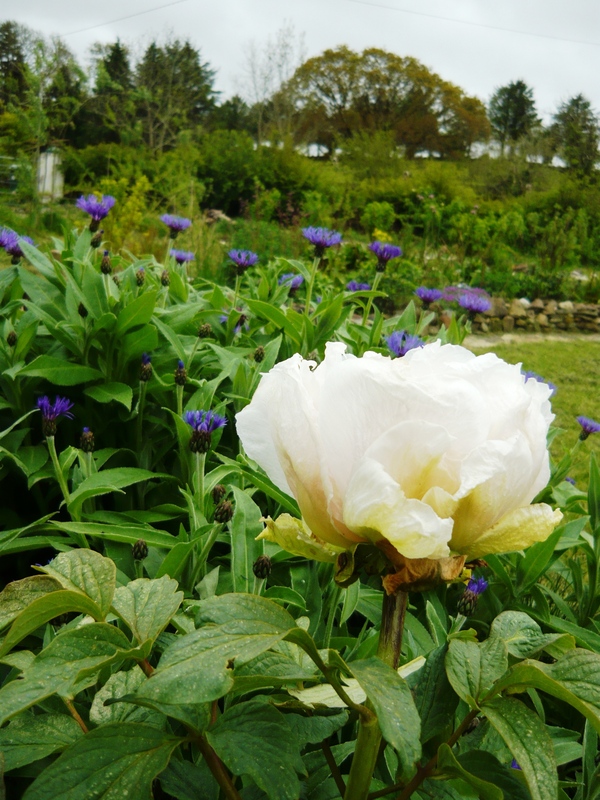 We are hoping the weather will warm up a bit in June so all our flowers and vegetables will come out to play. The Importance of Being Organized. 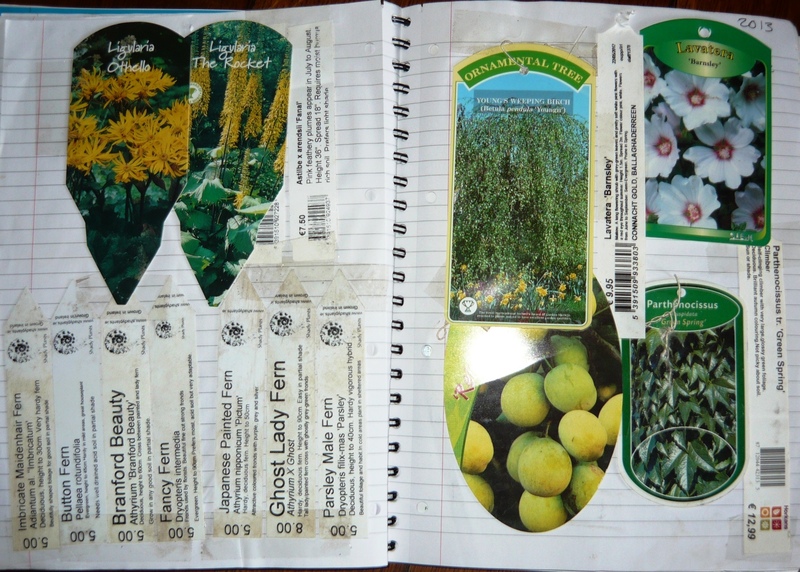 We are in our third year of creating our garden and one of our most important tools is our garden planning book with notes and labels. 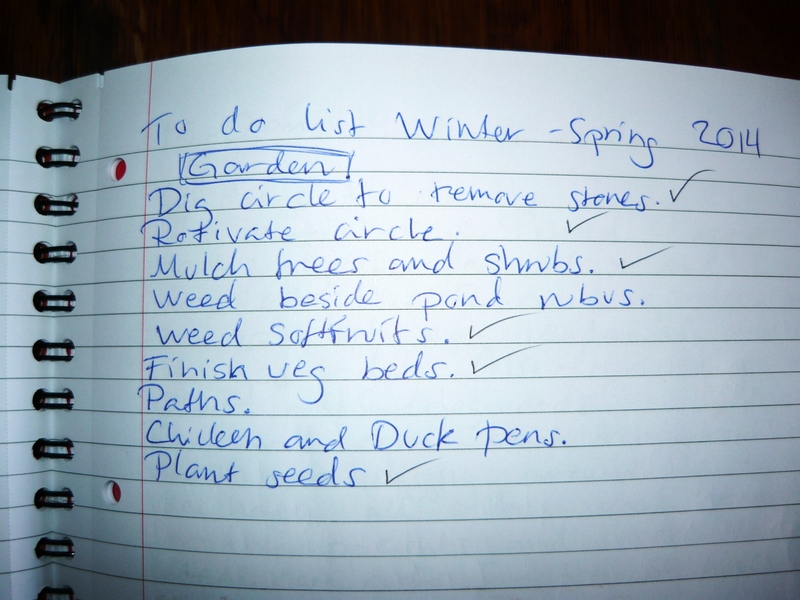 When you start planning a garden it is great to make a lot of plans on paper as it saves time, effort and money. 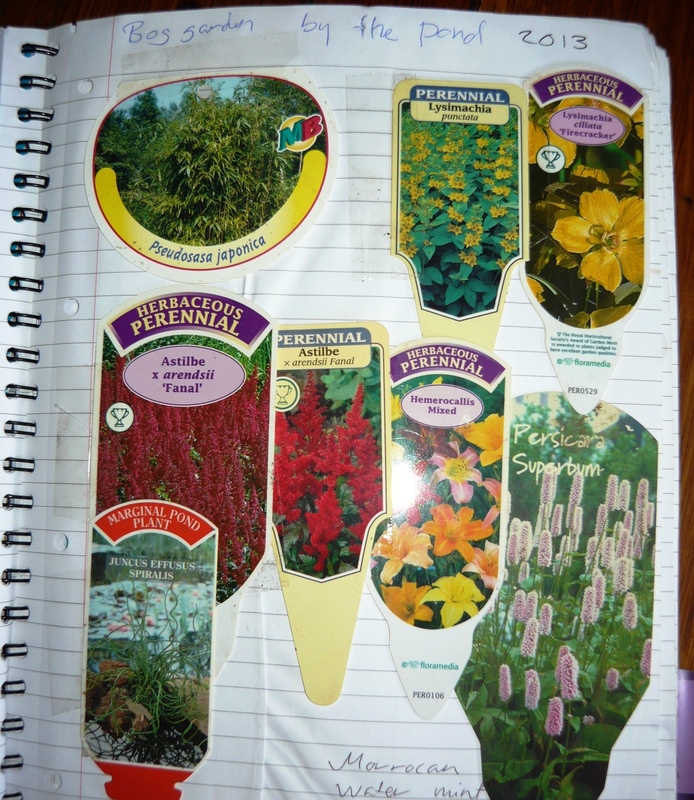 It is great to look through books and magazines for ideas and also think about what you want to use your garden for. Do you have to consider young kids, disabilities or pets? 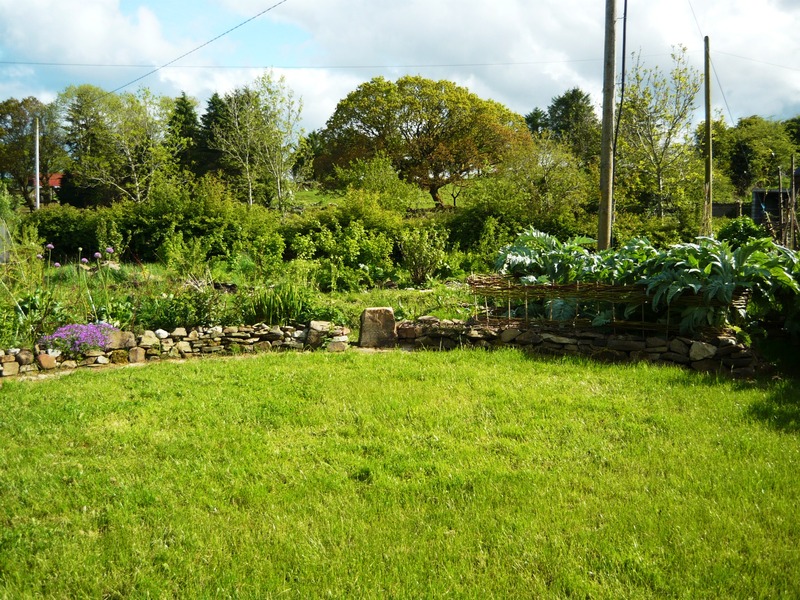 Do you plan to grow your own food or have a purely decorative space? 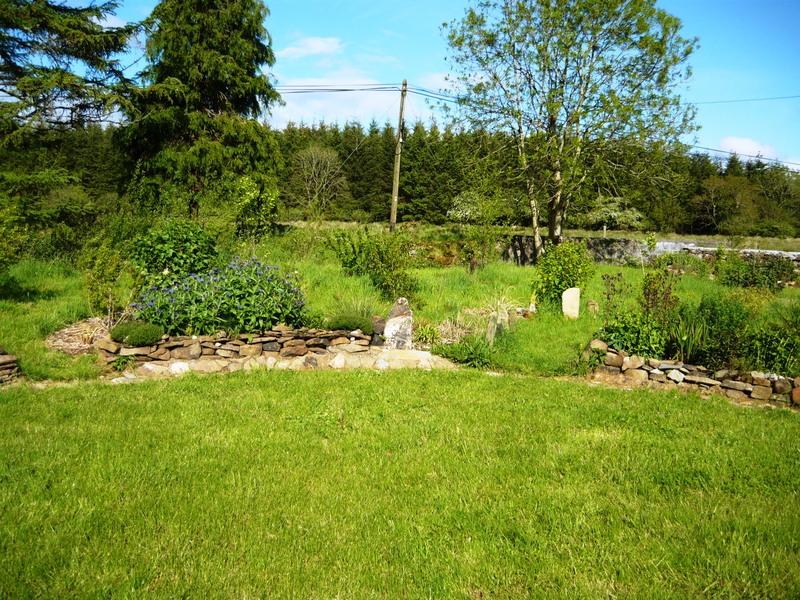 Do you want a formal layout or a wild billowing mass of flowers and shrubs? 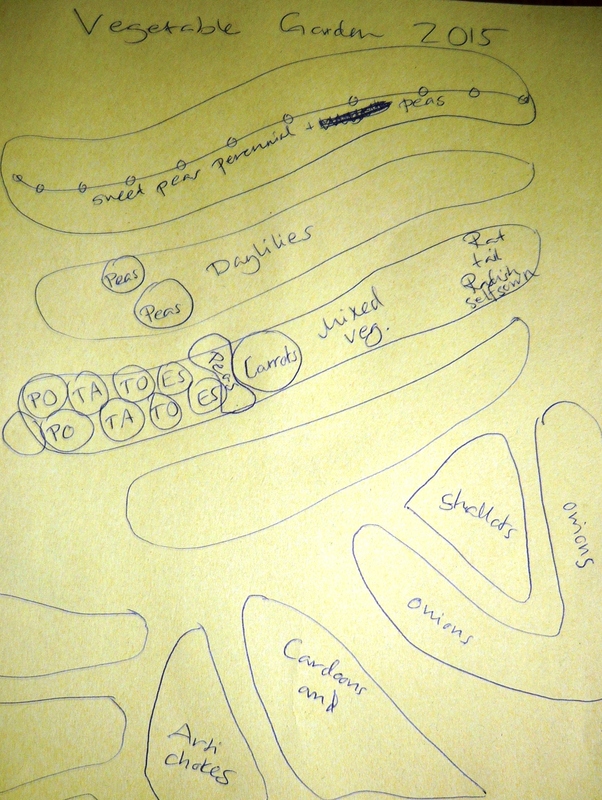 Our plans were for a wildlife friendly garden with lots of food plants and space for our teenagers and friends to hang out. The book has been helpful in keeping a record of our journey. 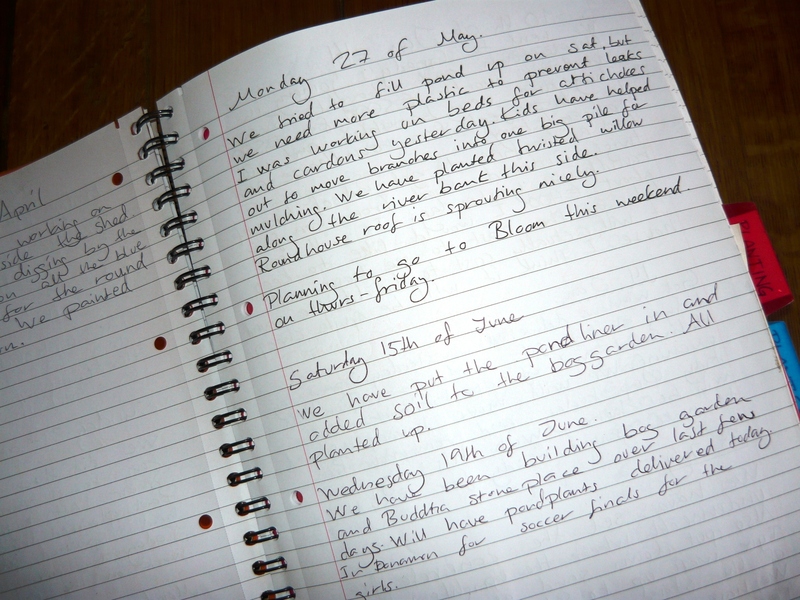 We have for instance made notes in our diary part of the book about when we started digging the pond, what plants we put around it, What is doing well and what has had to be moved and so forth. 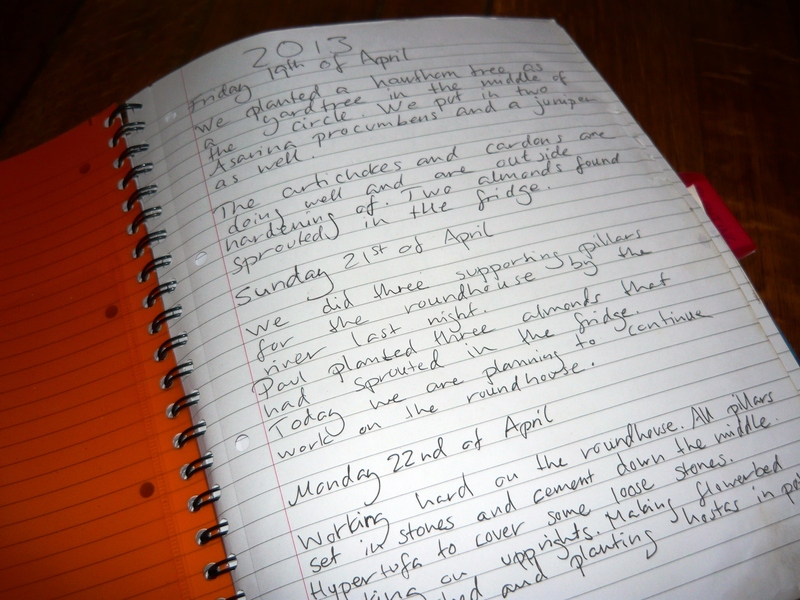 It is a lot of fun to look back through the notes and see how much you have actually accomplished. 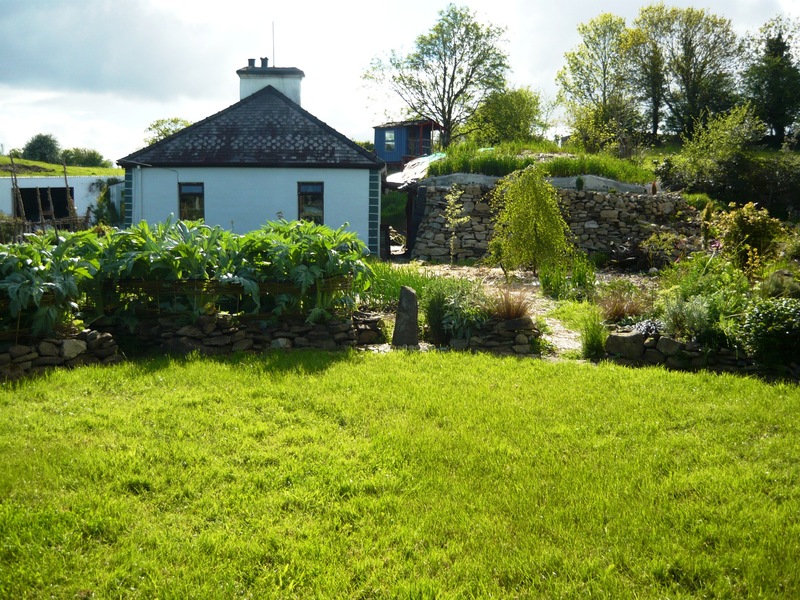 Sometimes when you are creating a garden from scratch and also are renovating your whole house it is easy to lose track of the progress and only see a lot of half finished projects. This is when the book comes in very handy for a bit of reassurance. 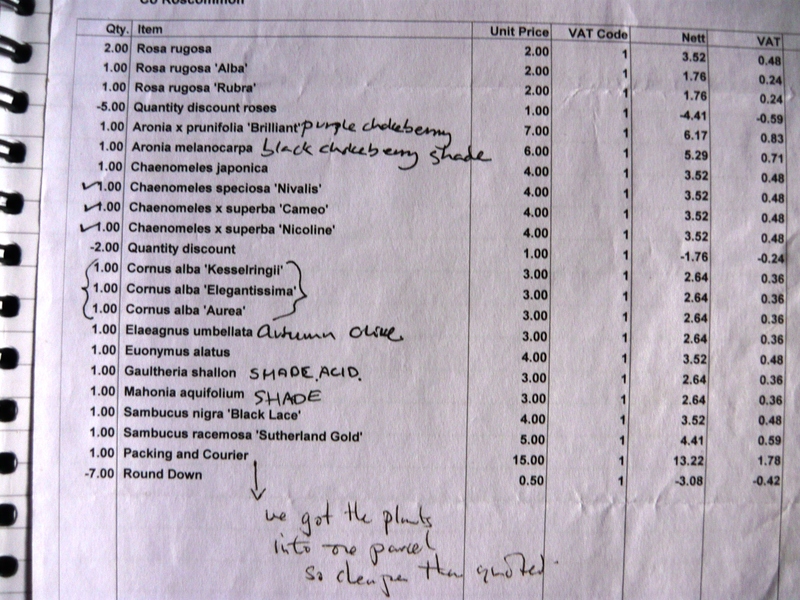 We got the plants into one parcel so cheaper than quoted. 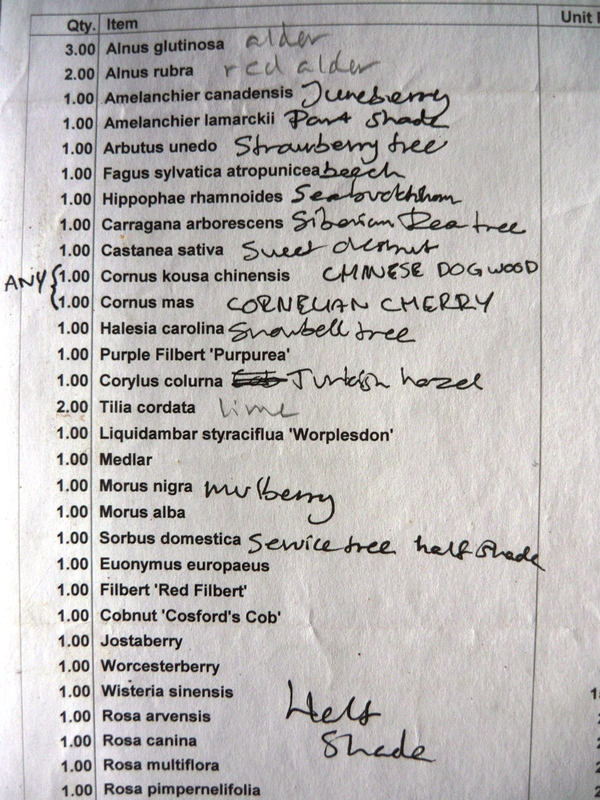 This was our main tree order and a lot of the trees are now taller than any of us and wider too. It is doubtful if any of them would fit into a parcel now, even on their own. 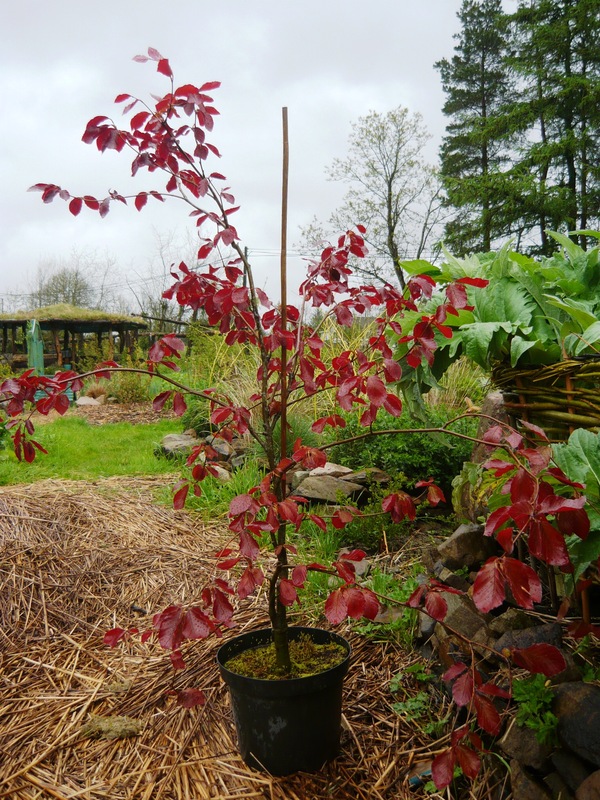 The best advice we can give to anyone starting a garden is to buy your trees small. They soon catch up and grow bigger faster than the pot grown bigger expensive specimens, sometimes available at Garden centers. It is also very important to mulch around small trees. 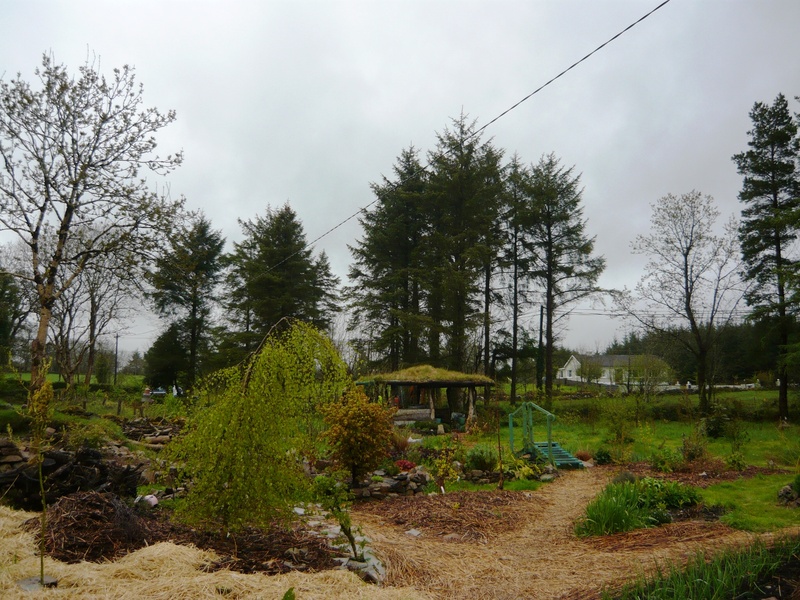 We use double layers of cardboard boxes and natural mulch like wood chippings or straw. It only needs topping up once a year. The trees can grow away without competition from smothering weeds and without drying out. This in combination with a generous helping of well rotted manure in the planting hole has set all our trees off to a good start. Our babies are growing up! 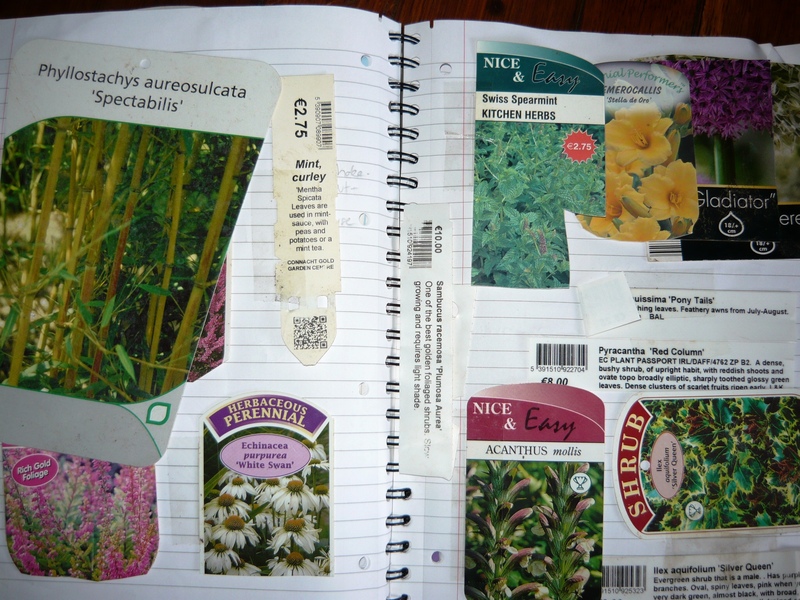 We have made a lot of planting plans for different areas of the garden with the plant labels attached to the pages. It is fun to be able to tell friends, when you divide and share a plant, what the botanical and common name are and what particular variety they are getting. It is also nice to be able to remove the unsightly labels from trees and shrubs, but still keep track of where the different varieties are planted. 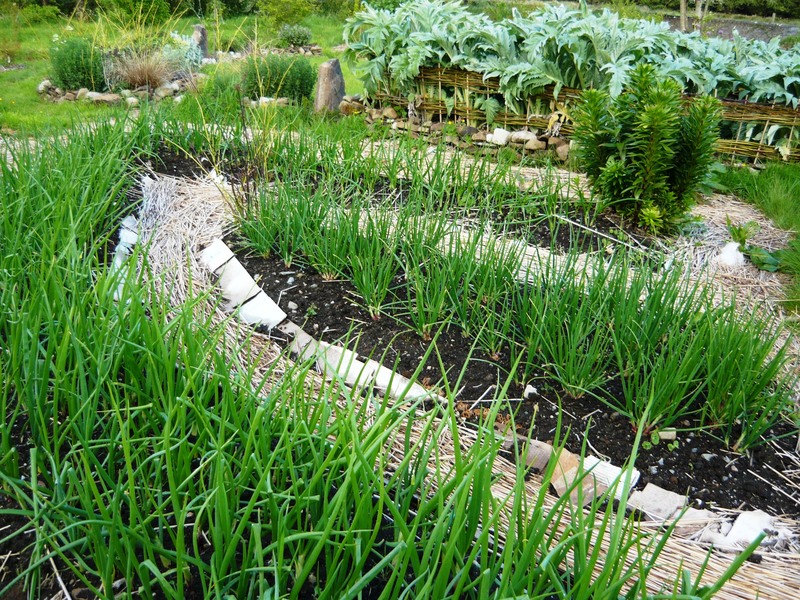 Vegetables do better if they are moved around the plot and not grown in the same soil year after year. 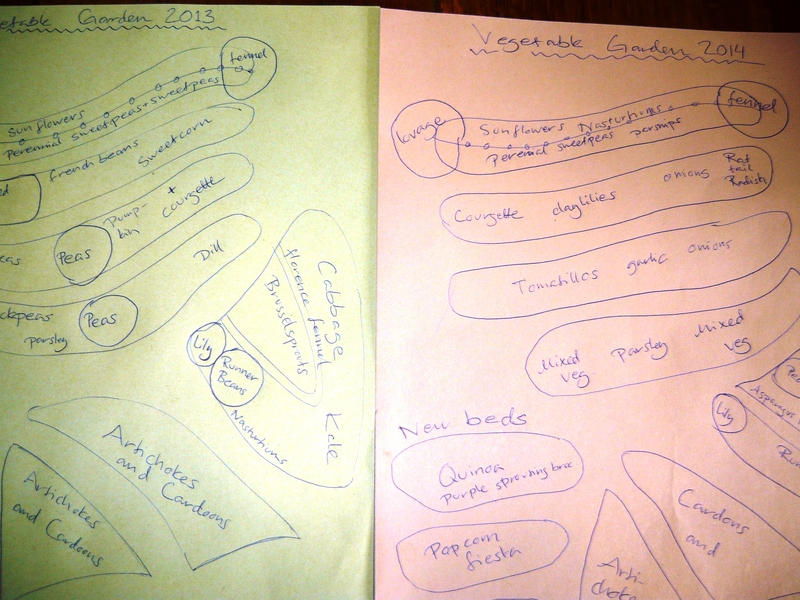 We have made quick sketches of the beds with what was growing in which bed each year. 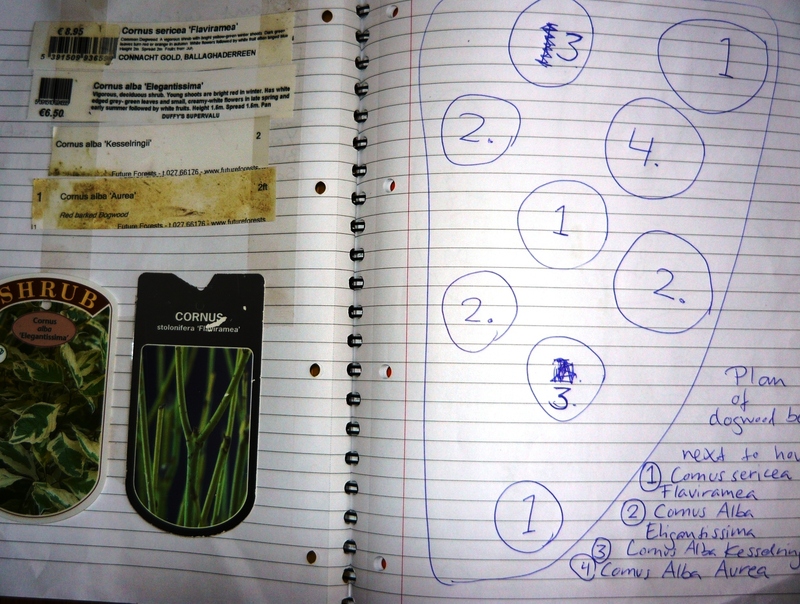 But we now have to come clean and tell you that we forgot to do this on paper before and kept it all in our heads, but now, while preparing this post we had to look back through photos of the garden to help our memories along. 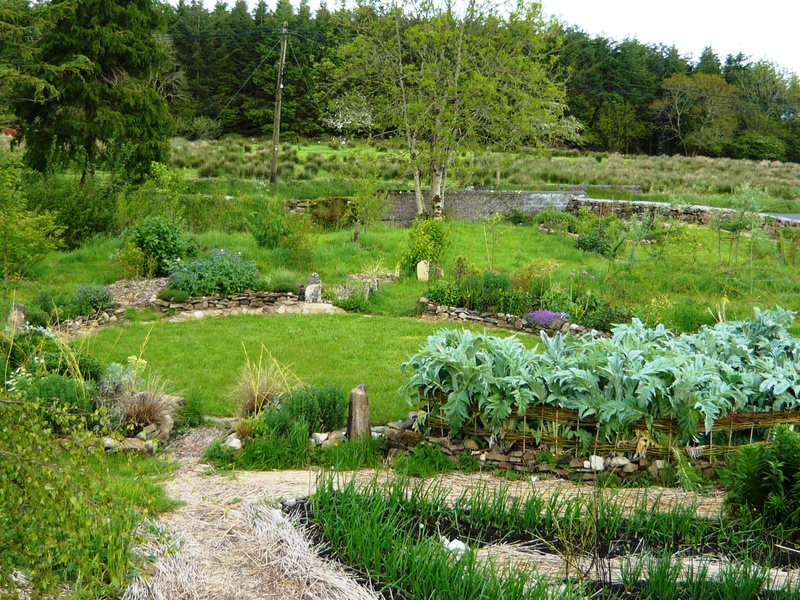 The ideal is to have a four year crop rotation, and we try to do this with the big groups like onions and brassicas. We also grow a lot of mixed vegetables and try different things for different years so hopefully we can keep on avoiding pests and diseases. 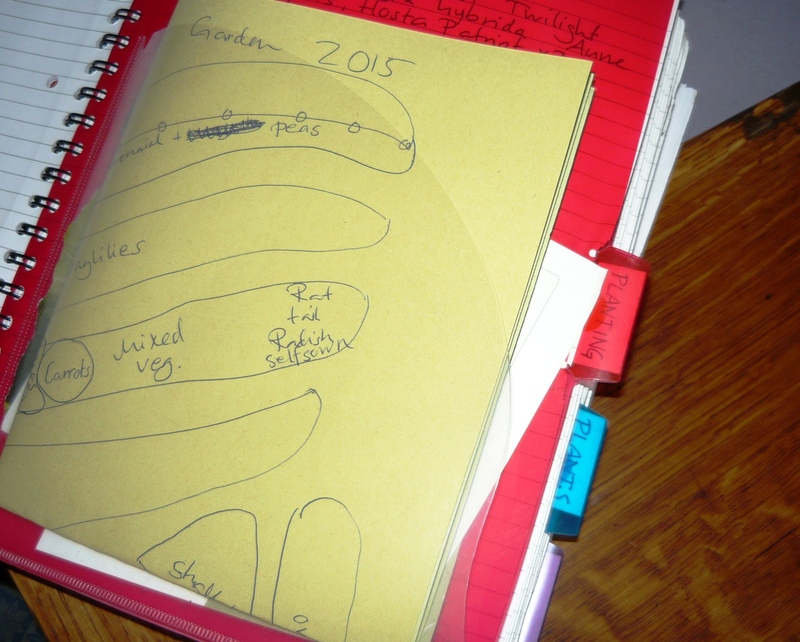 Our book has some practical pockets in each section for storing plans like this. 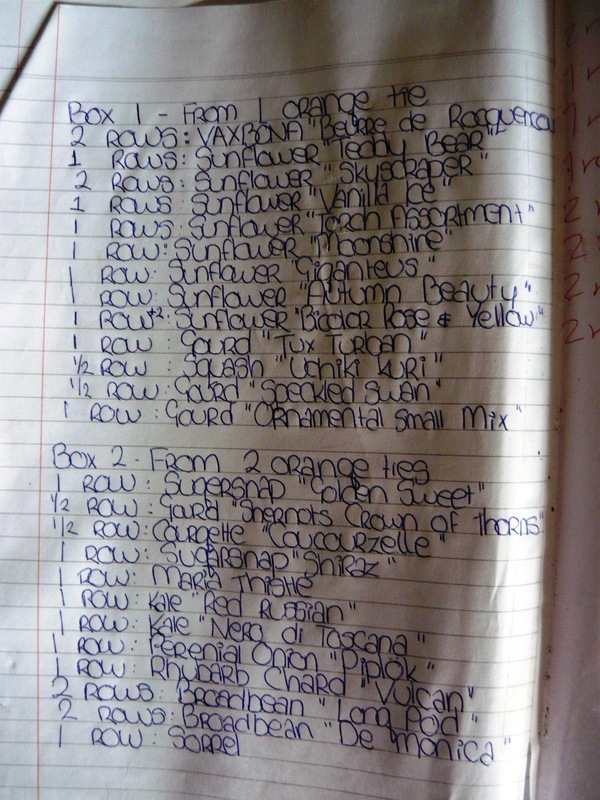 We believe that it is essential to keep a record book of the garden and if you do you will soon find that you refer to it again and again. Happy gardening! The key to a successful mosaic project is planning. You need to think about colour combinations, how bright you want the space to be and what tiles you have on hand. 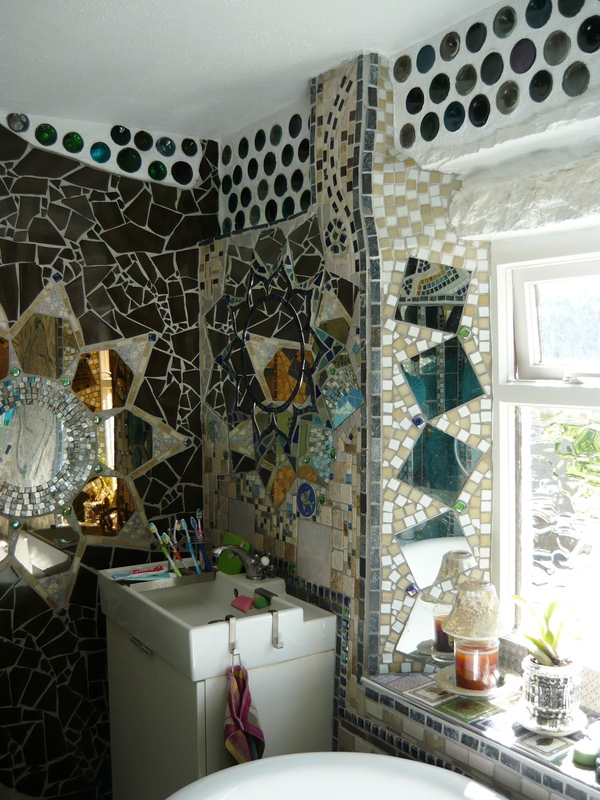 Do you wish to incorporate mirrors or pieces of broken crockery? What feelings do you want to evoke in people seeing your mosaic? In our bathroom we wanted a bright, calm and happy atmosphere so we decided to make mosaics in a neutral colour scale with mostly natural stone colours, with some mild greens, blues and turquoise incorporated. We added a lot of mirrors and sections of bottle brick walls to get as much light as possible. Even though the bathroom only has one small window, it is now the brightest room in the house. 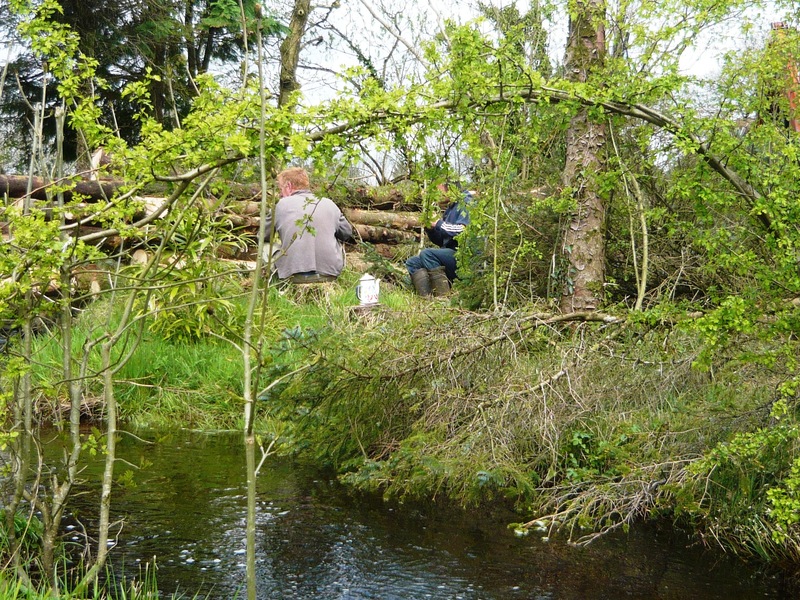 Woodland management on a small scale. 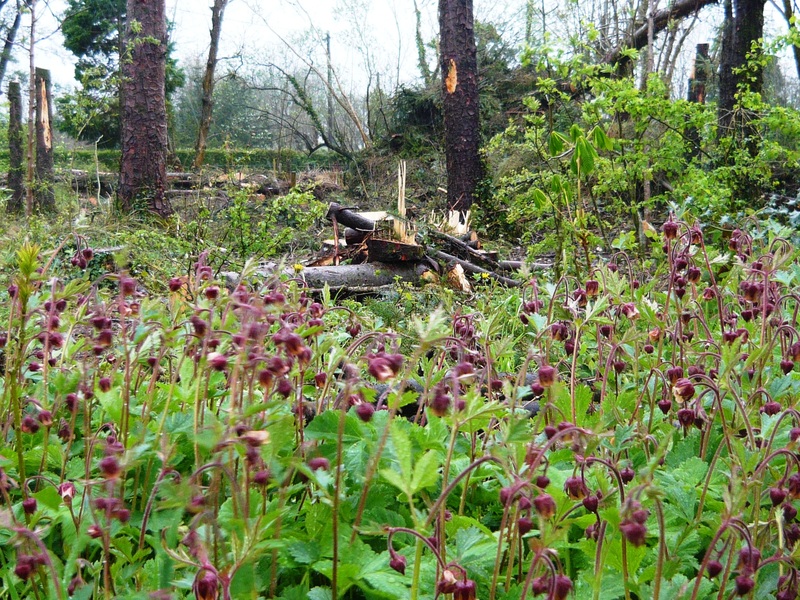 Our little woodland has had a complete makeover in the last few days. We had about 22 spruce that were planted in 1972. They were quite close together thus thin, tall and leggy. 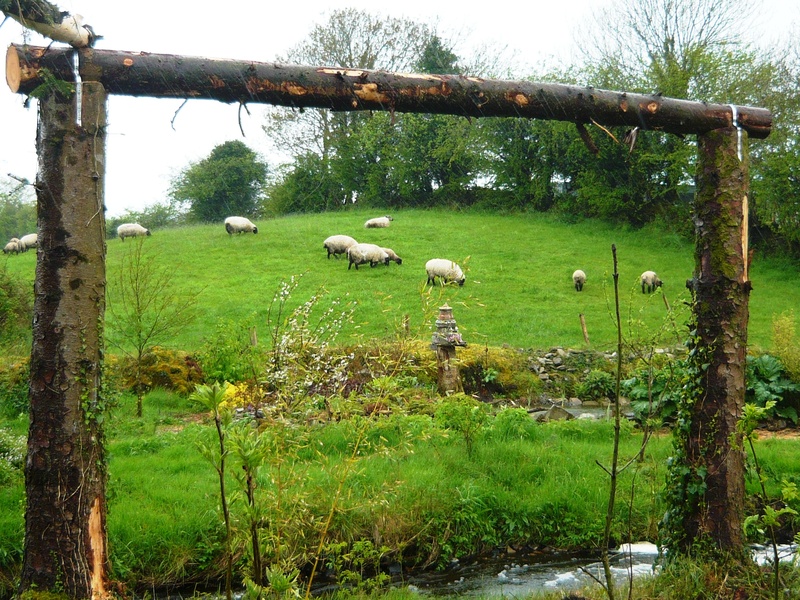 As the ground is boggy the wind had started to rock the roots and it was time for a change. We cut a lot of them quite high and used some of the cut trunks for crosspieces, creating supports for climbers. A lot of the logs will be used for firewood, some of the big thick ones will be supports in our conservatory and a few have been given to friends for their house renovation project. As we have electric cables right next to our woodland we got a friend with a digger to come around and make sure no trees went on the wires or on the road. We had a lot of willow and other tree saplings in the woods and we moved them to a temporary safe location, out of reach of falling logs. Here you can see the two tree fellers hard at work. 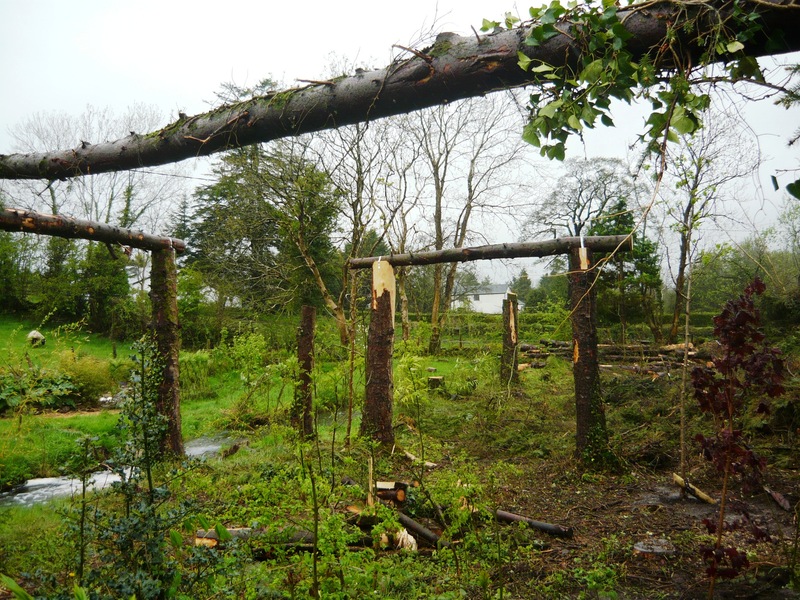 After the felling was complete we were left with a lovely bright space ready to replant with trees, shrubs and ground-covers more beneficial to us. 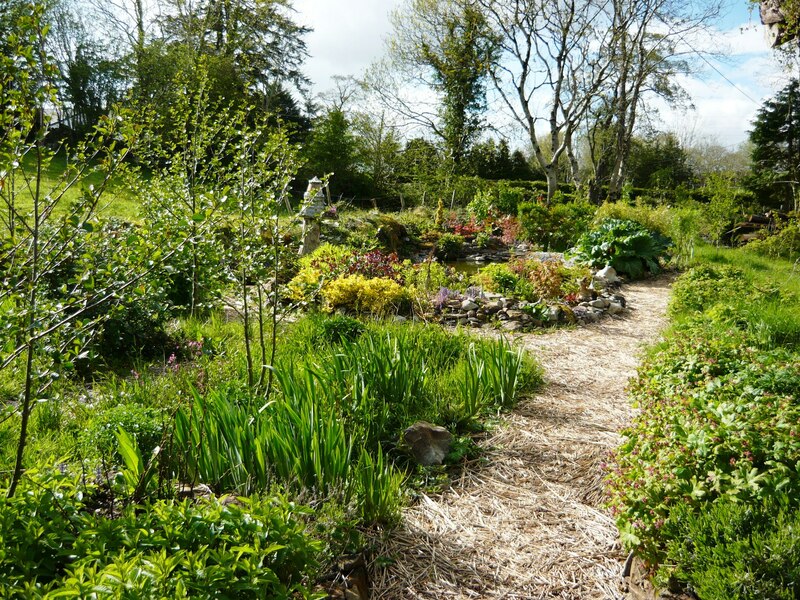 Our whole garden is based on the principals of forest gardening, where all plants have a purpose other than just aesthetics or fashion. 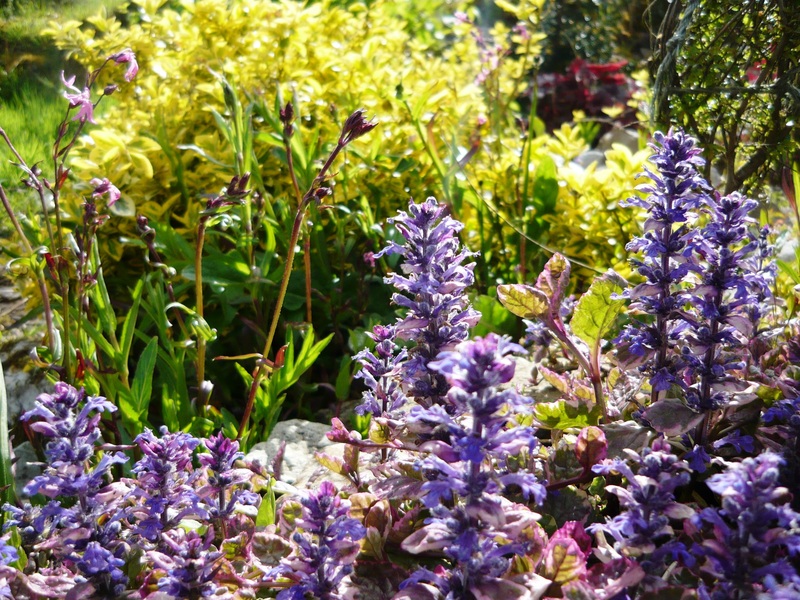 They are planted in a way as to mimic young woodland with a canopy, shrub and ground cover layer. 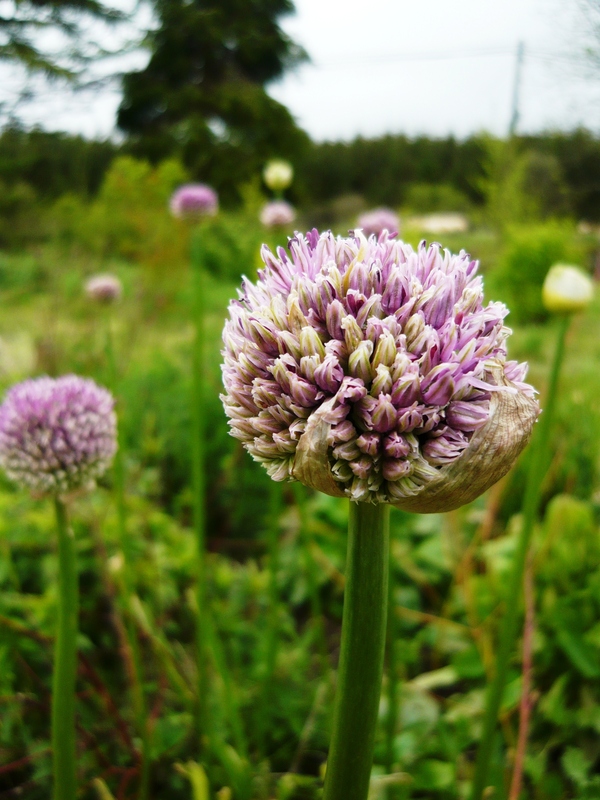 Plants are chosen for food production, wildlife, pollination, soil-improvement, firewood, medicinal purposes, basketry materials etc. 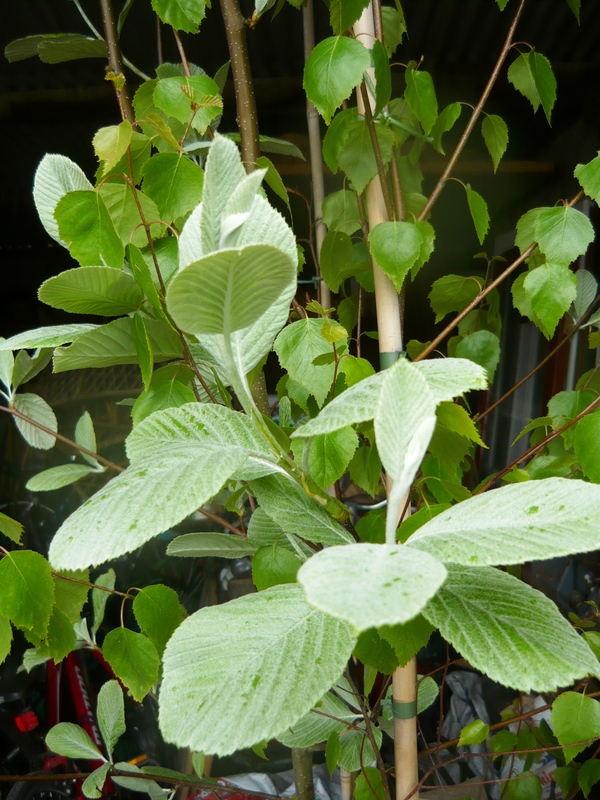 Did you know that lime, hawthorn and beech trees all have lovely leaves for spring salads? 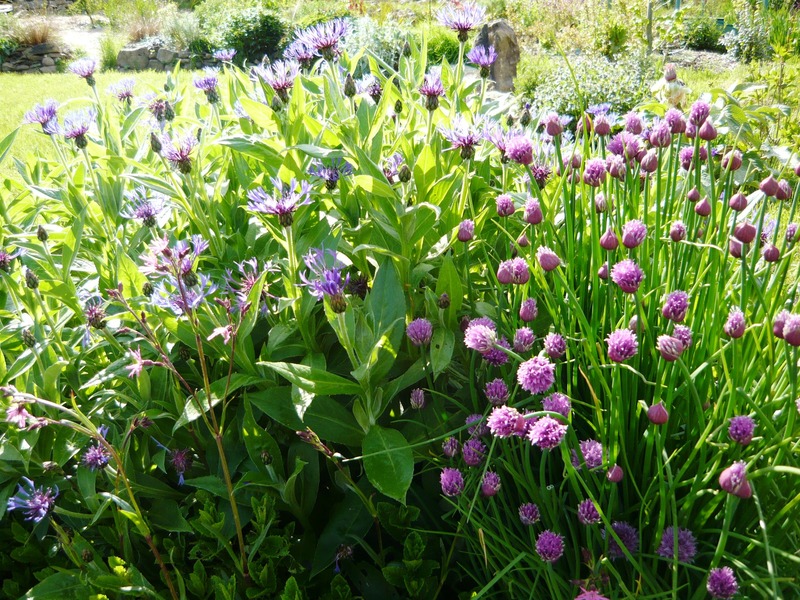 A lot of perennial vegetables are included as they are more reliable, often more nutritious and less susceptible to slug damage. Waiting to be planted out. 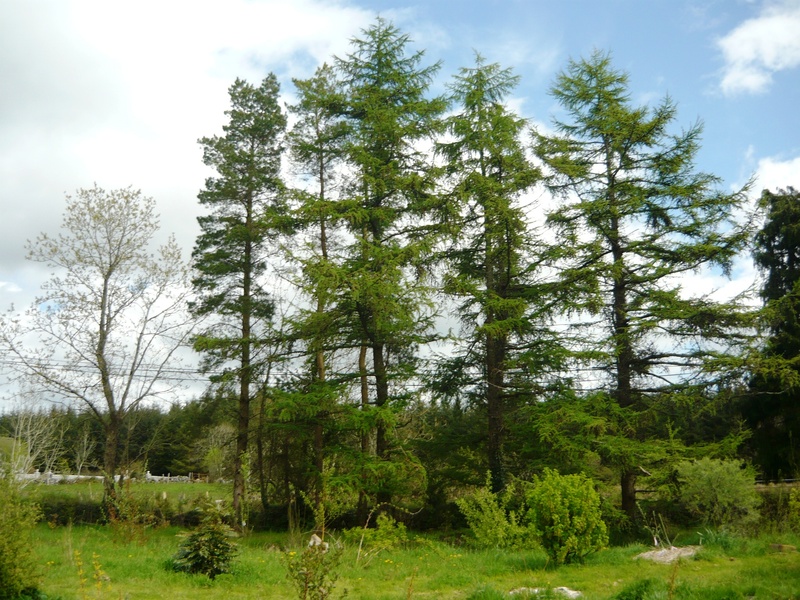 We have kept our beautiful big Scots pine and larch trees as they still have decades of life left in them. We are in the process of adding rowan, lime, beech, oak, willow, hawthorn, maple, birch and hazel trees to the woodland. 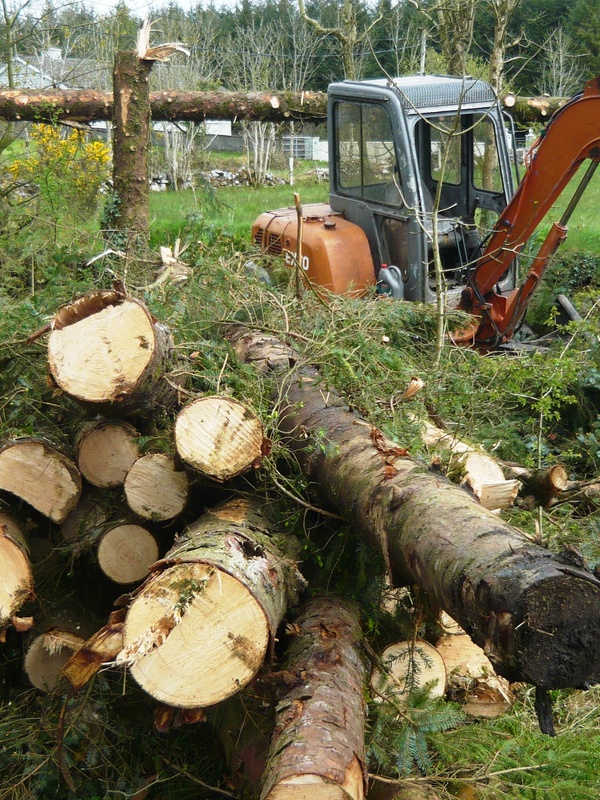 A lot of these trees will be kept pollarded or coppiced and we will use the off-cuts for fuel, plant-supports and basketry. We already have some mature ash trees along the boundary. 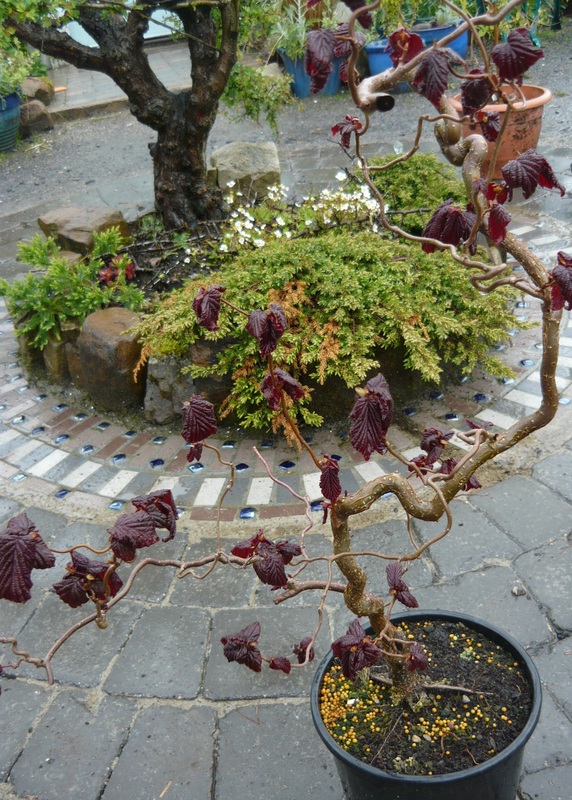 It was love at first sight when we spotted this copper beech at the tree nursery. 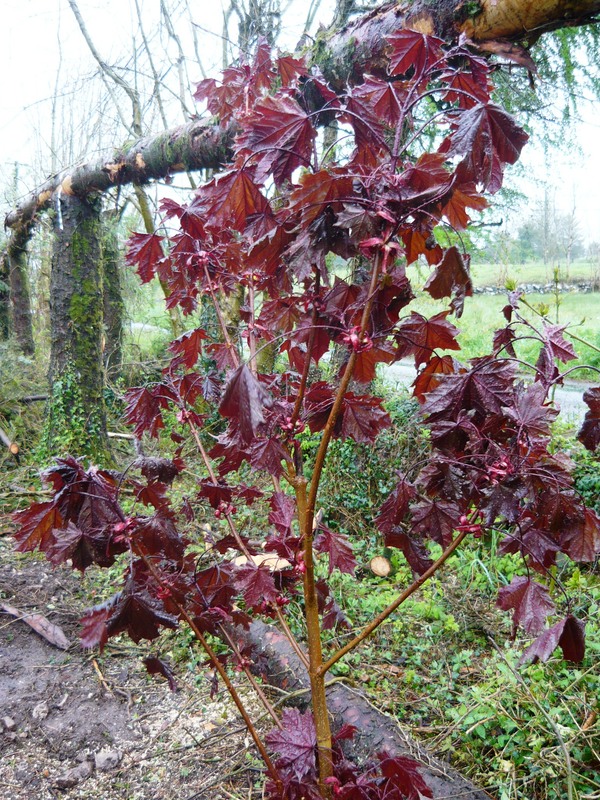 It had to be included in our new woodland as well as the stunning purple contorted hazel. You will have to imagine climbers growing up and across all of these structures. Old fashioned roses, honeysuckle, ivy, virginia creeper and clematis. 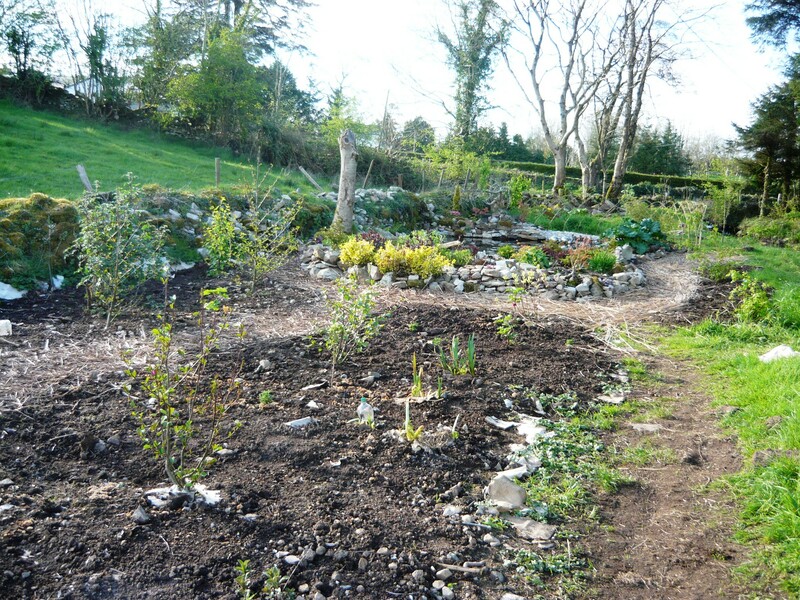 All of these will bring more wildlife and pollinators into our garden. 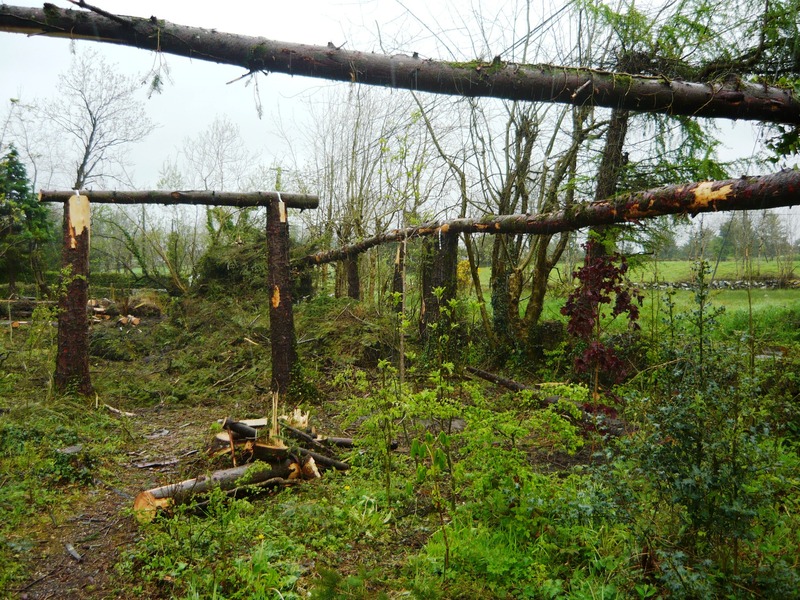 As the ground is boggy, we will use the brushwood from the felled trees to build it up and some trees will be planted on raised mounds so as to save them from water logging. 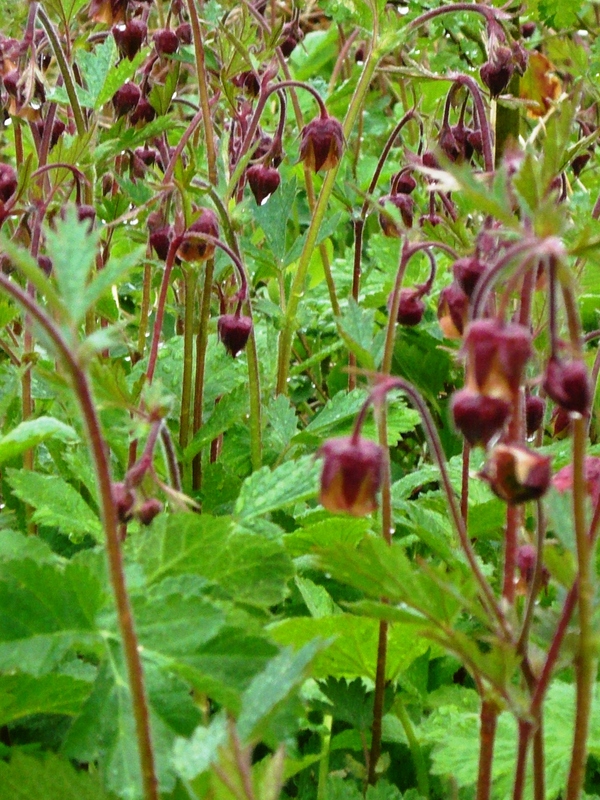 We will add water loving mints and wait for all of the marsh marigolds, wood angelicas, wood anemones and meadowsweets to come back. We have some beautiful native geums, which the bees just love. 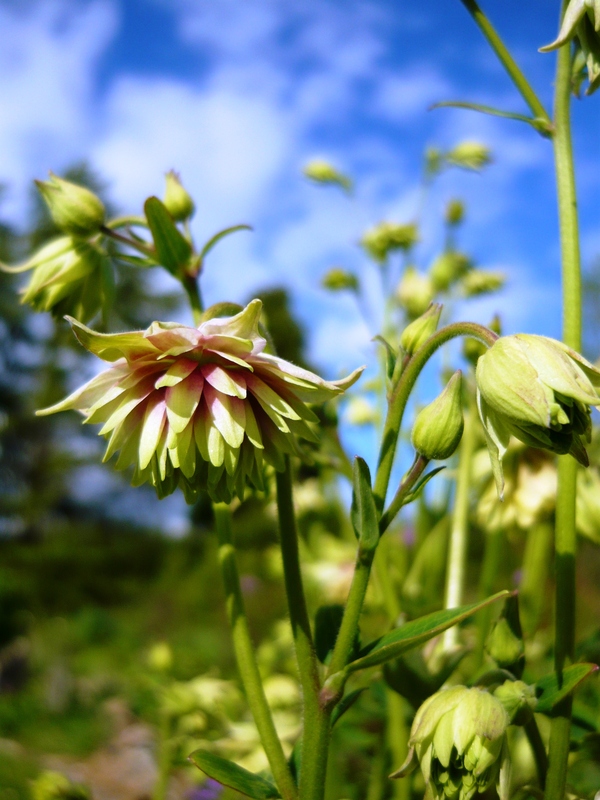 In Swedish they go by the name of humleblomster, which translates as bumblebee flower. 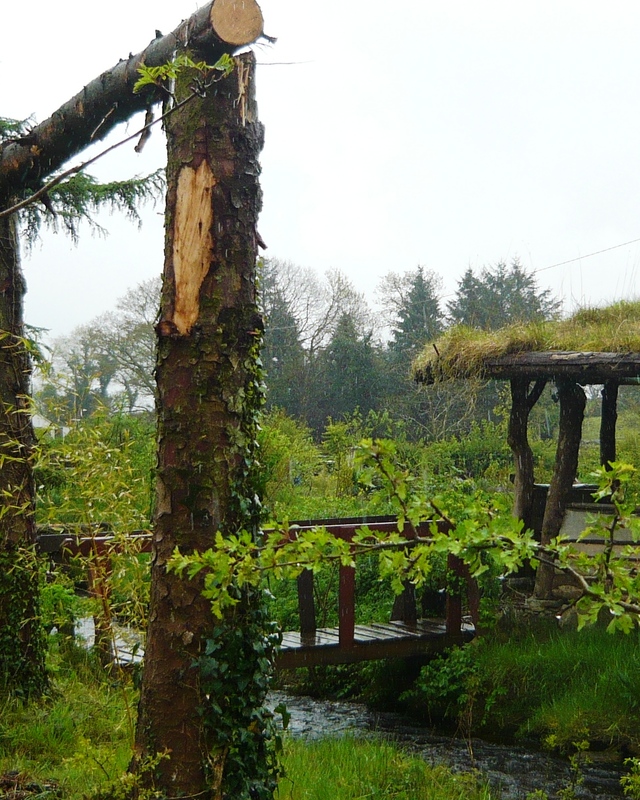 We are very much looking forward to seeing this part of our land transforming from a dark, boring plantation into a beautiful diverse habitat for us and all our visitors to enjoy. People and animals alike. We will show you the progress here over the months and years ahead. New floors inside and out. We have had a busy first few days of May, finishing off two projects. In the bathroom we finally got to the last stage of the renovations, laying the mosaic floor. 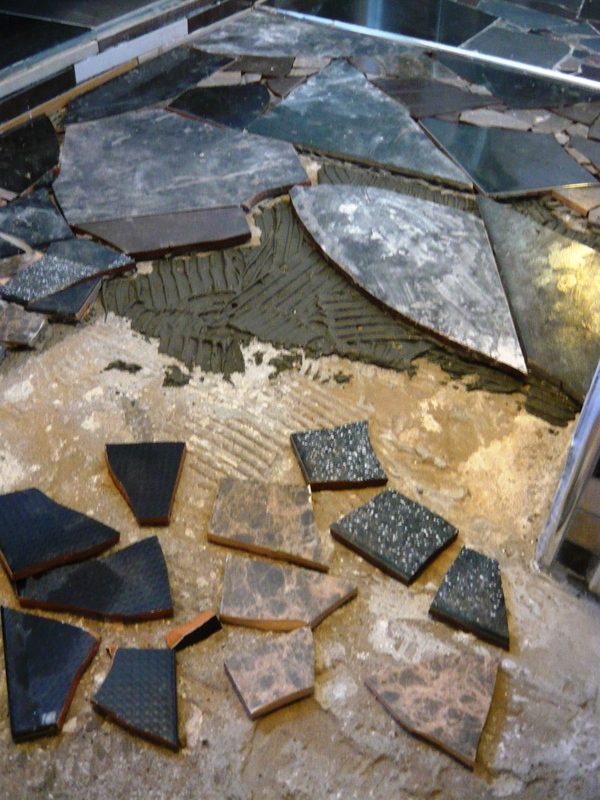 We got all the tiles for the floor free from a skip outside our local tile shop. Because the walls are light and include some subtle colour we wanted the floor to be quite dark and neutral as a contrast. 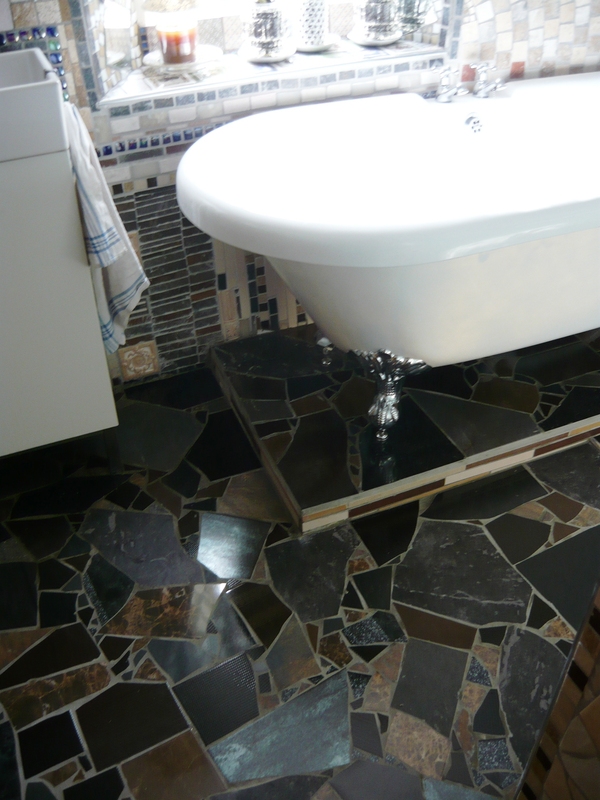 For the wall mosaics we used ready-mixed tile adhesive as it is easy to use for precise applications of small tiles but for the floor we opted for a heavy duty cement based floor adhesive that we mixed up ourselves. This is more economical and we believe stronger for walking on. It is important to only mix up what you can use in about 45 minutes as it starts to set after that. Spread it on a small area and put down your bigger pieces first and adding smaller pieces where they are needed as you go. 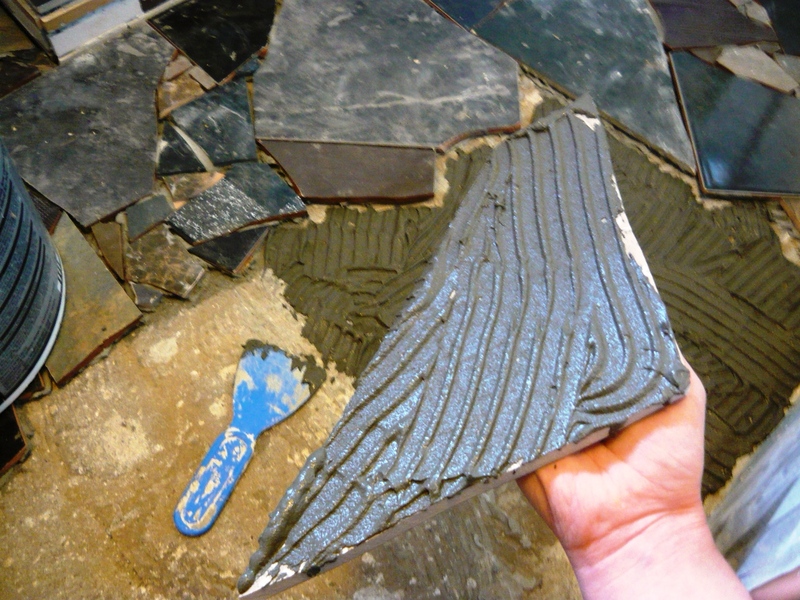 Some tiles are thinner and need a bit of adhesive added to the back as well. Use your fingers and the palm of your hand to check that all the tiles are level and you end up with a smooth, kind to bare feet floor. 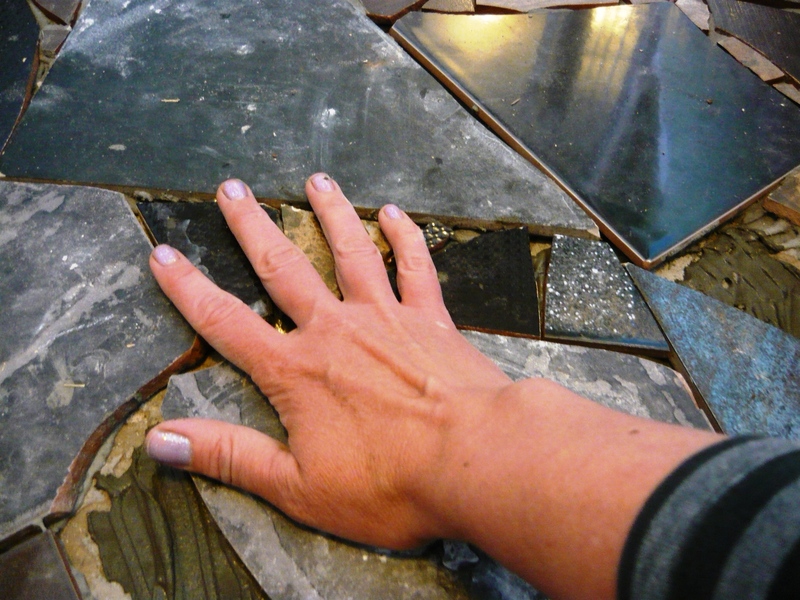 Let the adhesive set for a few hours or overnight before grouting. 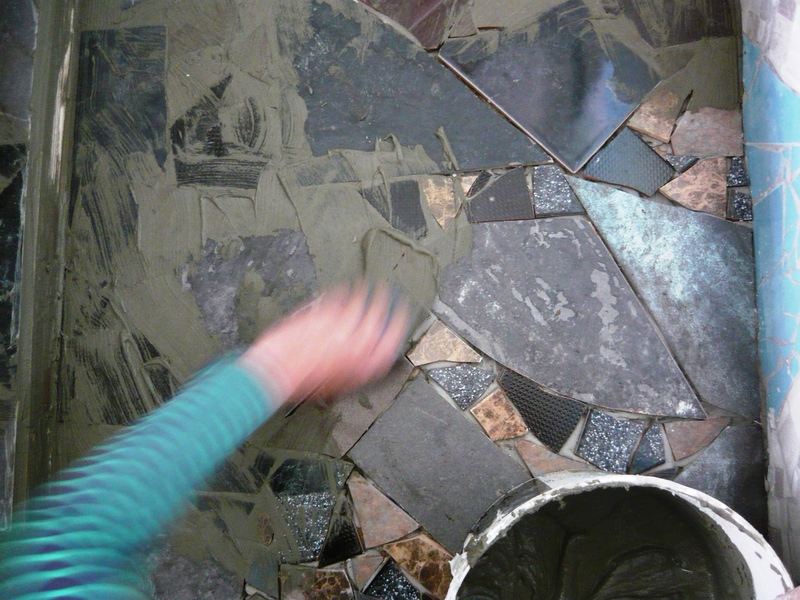 It is important to add the grout and keep smoothing it down, pressing it into all the gaps and crevices. When you are happy with the results let it set for a couple of hours before carefully wiping it with a damp cloth. You want to remove the excess grout but be careful enough not to rub too hard and take away too much grout from the joints. 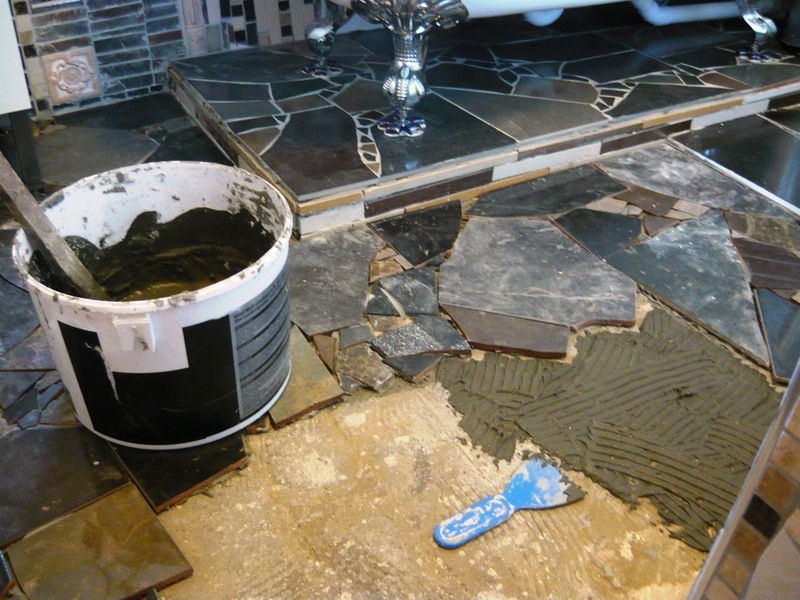 If you have never grouted anything before it might be good to start in a not so visible place of the floor to get the hang of it. 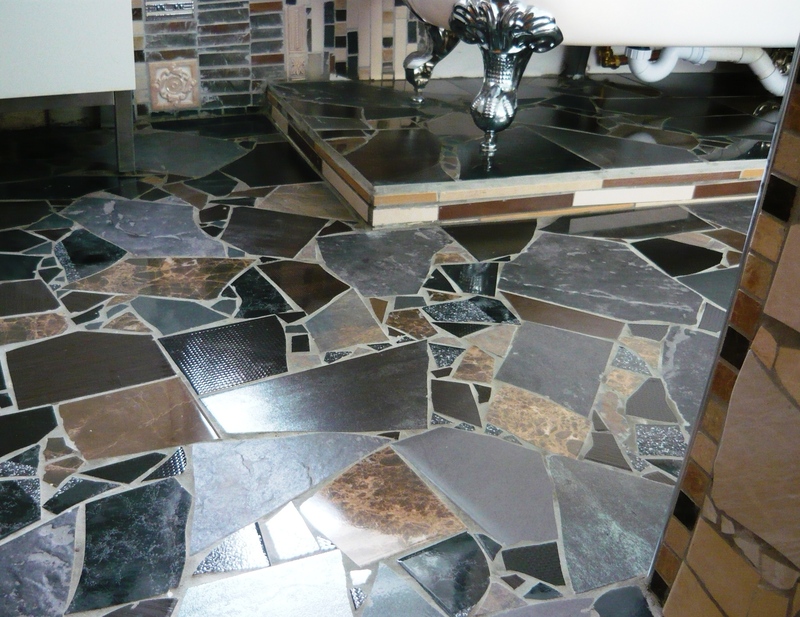 Let the floor grout go off and do another wipe or two to get rid of all the excess grout. After that all you need to do is polish it with a dry cloth until it shines and admire your handiwork. We are happy to have made a beautiful strong floor that should last our lifetime, for next to no money, mostly with materials aimed for landfill. While working on the bathroom we also made good use of the few sunny spells to put down paving stones on our outdoor area in front of the house. 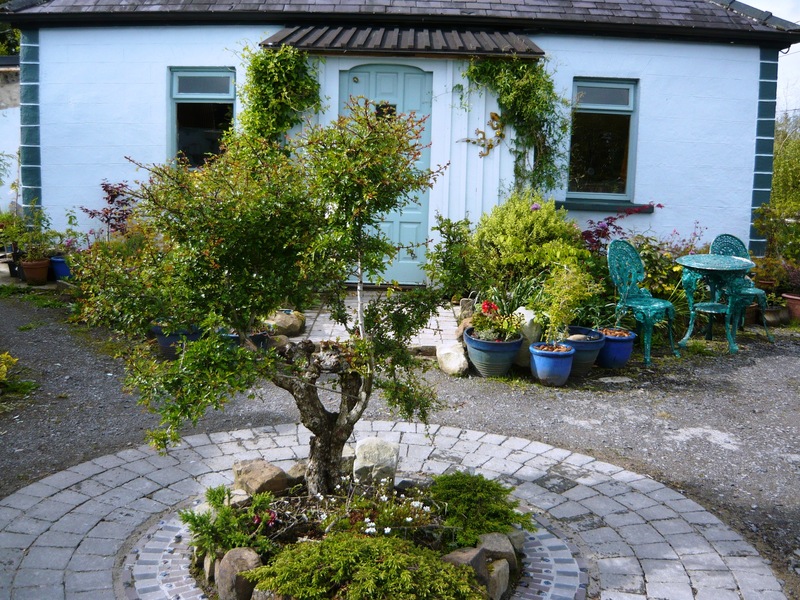 When we moved in we planted a beautiful old hawthorn tree, which we rescued from behind our shed, in the middle of our front yard. It is an ancient custom in Sweden to plant a tree for prosperity and luck in front of your house and since half of us originate from Sweden we wanted to honour this tradition. 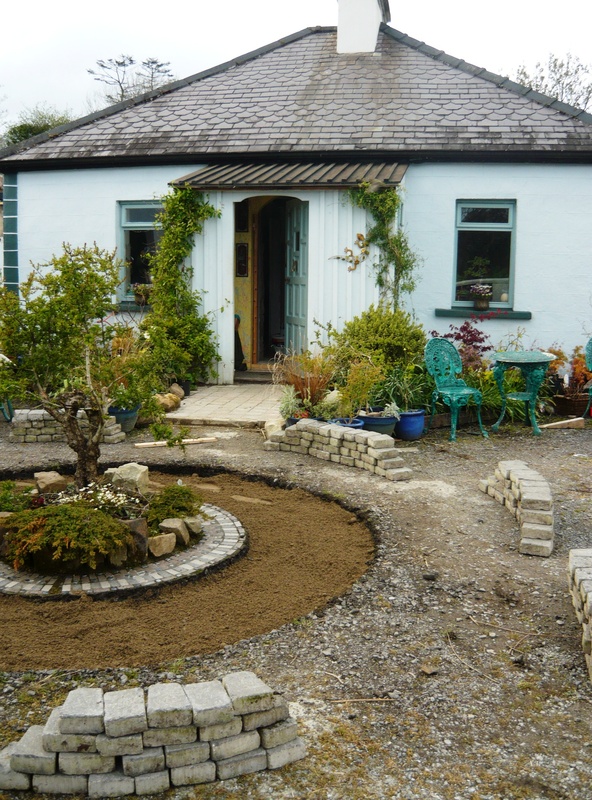 Around the tree we wanted a circle of paving stones and we were lucky to get some cheap from a neighbour who had them left over from a project. 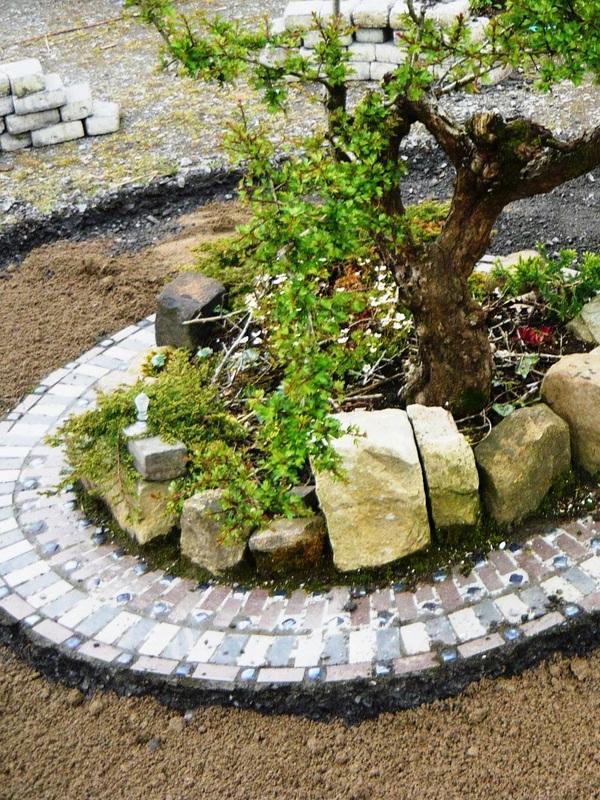 We started off with a small recycled mosaic circle set in cement and grouted with hypertufa. 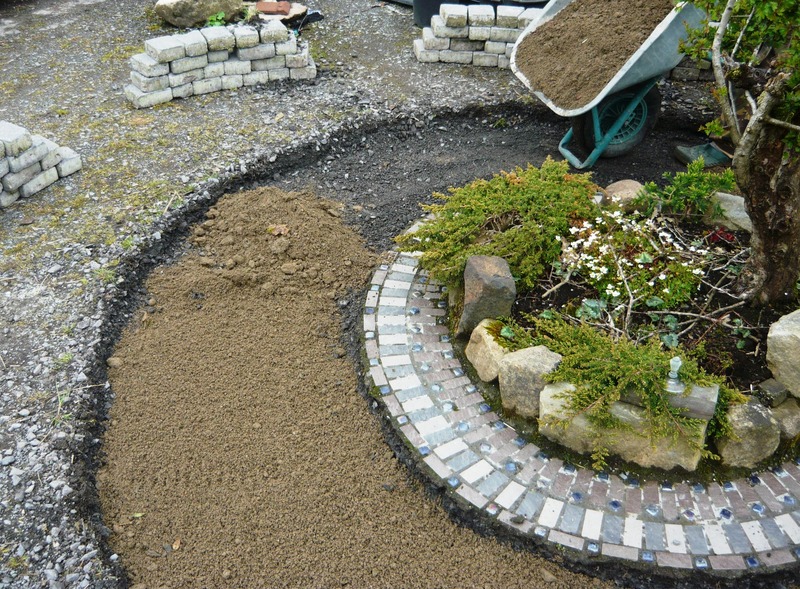 After that we dug down to slightly deeper than the paving stones height and added some sand for a smooth bed. 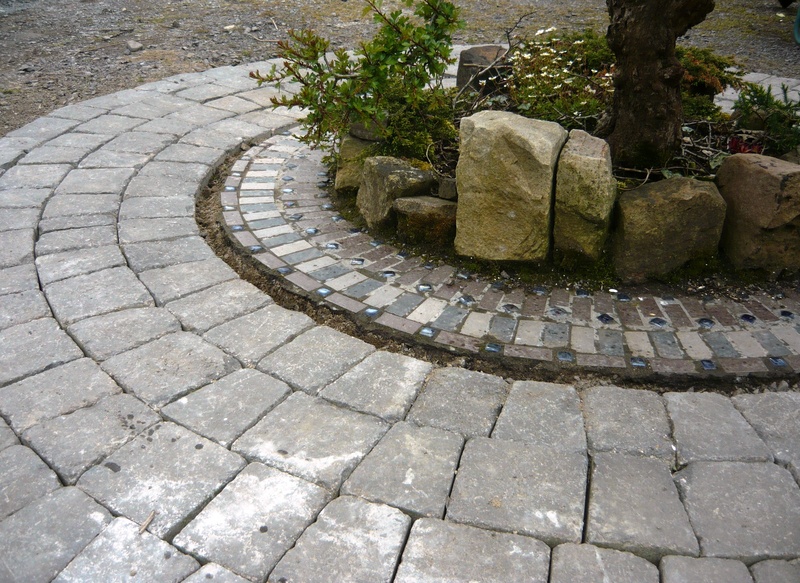 The paving stones went on and were tapped down with a sledgehammer but we were not too bothered to get them all even as it adds character when they are slightly uneven. 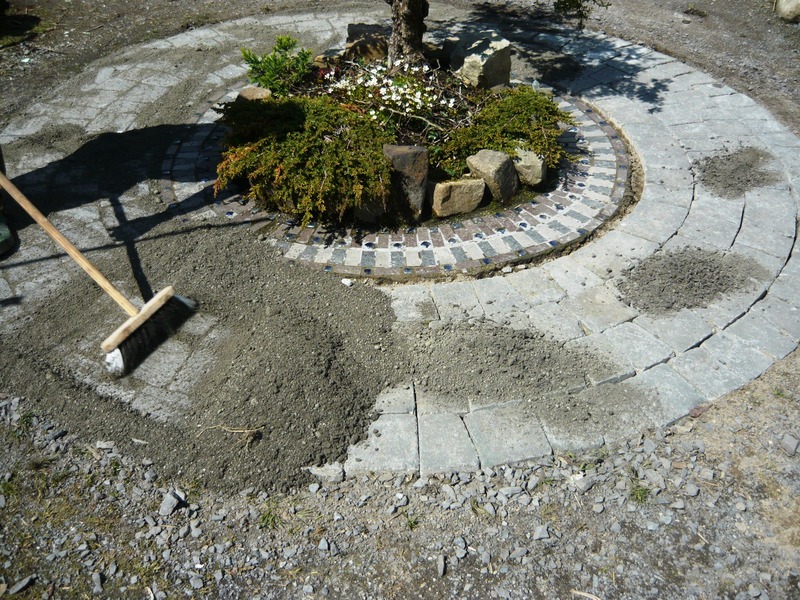 We added a dry hypertufa mix of one part cement, one part compost and half a part of sand to all the cracks. It is good to tap the stones slightly so the mixtures settle in and more can be added. 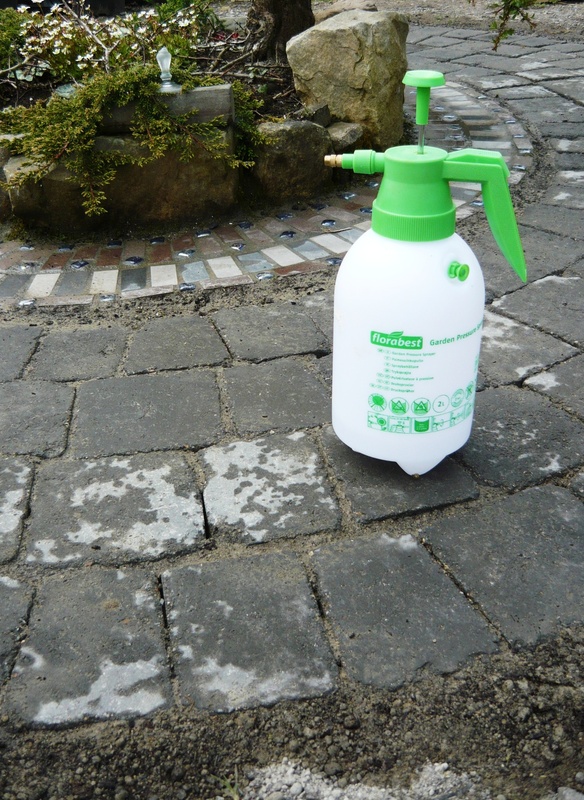 We then watered all of it with a fine spray to wet the mixture and wash it away from the surface of the paving stones. 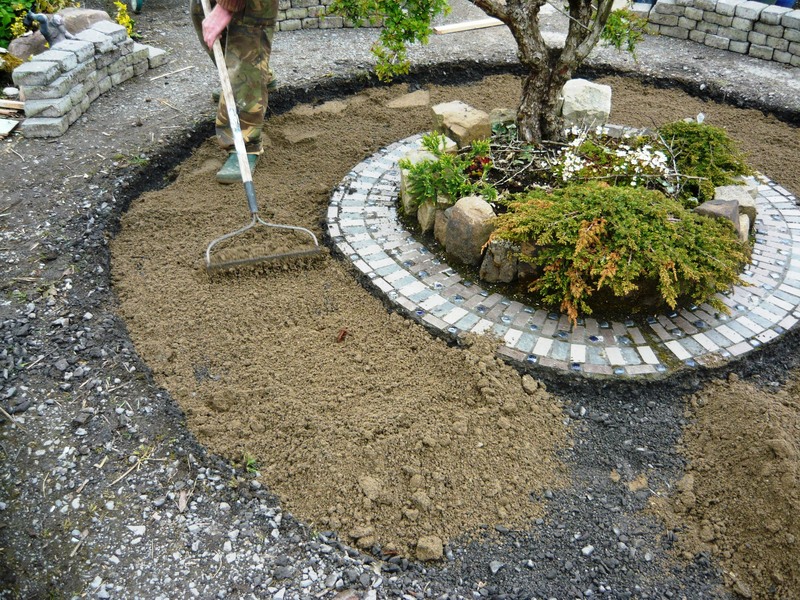 Later we will add a little more hypertufa mix as it has sunk down from being watered and add a mix of yoghurt, moss and sugar to get the moss growing rapidly in between all the paving stones for a natural look. The total cost for this project was about €25.